25 2011 August will be held long-awaited opening of the first IKEA store in Bashkiria. At the opening ceremony invited the first persons of the Republic of Bashkortostan, Ufa city, as well as representatives of the Swedish Embassy in Russia. 18 August, a technical opening of IKEA store in Ufa, which has become a "dress rehearsal" in anticipation of the grand opening. "Our goal today - to ensure absolute readiness to store all of its employees and technical systems to the long-awaited meeting with buyers," - explained Natalia Shestov, project manager of IKEA in Ufa. On the same day the final of the competition, at which representatives of the company and the leading media of the Republic chose furry mascot of the new store. In good Russian tradition, the first in the new house will include a cat - a symbol of comfort and warmth. 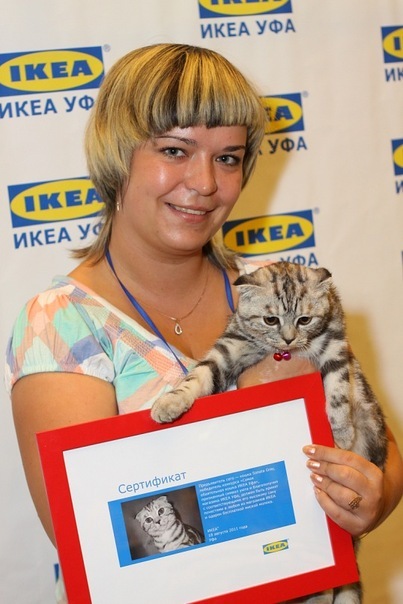 The honor to open IKEA Ufa had the youngest of the five semi-finalists, charming Sonata. "I still can not believe that we won - says an enthusiastic hostess. - Sonata, though she was only five months, unlike me, do not worry and feel of the IKEA home. It seems to have a couch and looked after myself. " 25 August Sonata Gray fulfill its honorable mission and be sure to bring good luck to all customers and employees of the new store. Her name will be immortalized in the list of cat-discoverers, and in any IKEA store in Russia for it will always be ready a bowl of milk. "Today is an important day for us, - said Anna Solodovnikov, director of the IKEA store in Ufa. - And now I can say for sure that we are well prepared for the opening. Swedes IKEA have much credibility than the government and the royal family. On behalf of the two hundred and forty of our store employees I promise that we will do everything to deserve the same love and respect for the residents of our city and the republic. " By the way, this is not the first experiment of IKEA with cats. In 2010 year IKEA shot commercials with 100 cats that were running, playing and sleeping in her store. This video you can see in our video gallery.